Parents everywhere can relate to the challenge of finding balance between your everyday responsibilities and enjoying a moment with your children. 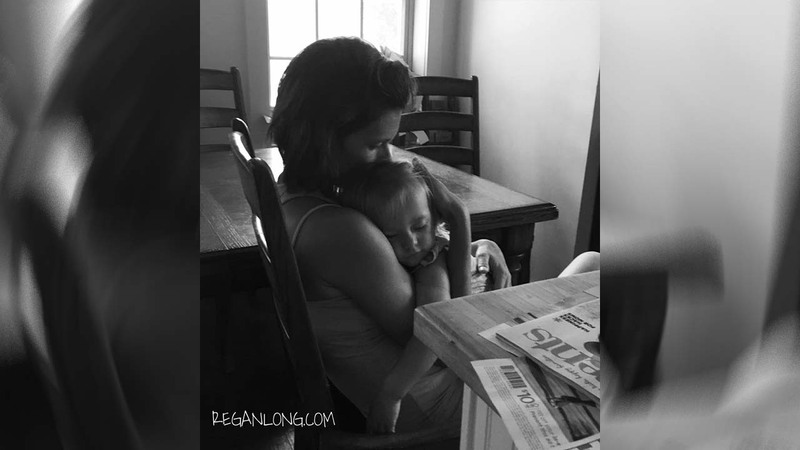 Regan Long, who manages The Real Deal of Parenting blog had a long to-do list one day, but instead she decided to do something else. She decided to pause and be present with her child. Because instead ... I held you. I was going to grab my two minute shower and if I was lucky, I was going to blow dry my hair and maybe throw on a little make up. I was going to vacuum up the crunched mini wheats that you accidentally spread through the living room and stair well, and likewise clean up some of the toys that are strewn in every room but the playroom. I was going to carry you upstairs and lay you down as I was pretty certain you wouldn't awake if I did. Maybe you would have been more comfortable in your bed? It turns out that my plans for this time weren't going to accomplish what I have right here in my arms. Long also posted the blog entry on The Real Deal of Parenting Facebook page and it's inspiring moms around the country. "I have tears streaming down my face," wrote Chantelle Camp Colinet. "I love this....what I would give to have my little man fall asleep in my arms....it has only happened maybe twice." "My teenagers follow me to bed and lay there and talk to me," wrote Angie Howd Tooley. "Sometimes I would really like to read, or have a minute to reflect on the day or just breathe. But the book will always be there, and they won't."